Most of us - classic gamers know Ventrilo, but some of you may not. So, feel free to do a little search on keyword "Ventrilo" if you have no idea of what it is. However, in supporting for this topic, I'd like to presume the Ventrilo program as a free VoIP software which is often used by gamers to communicate with other players on the same team of a multiplayer game, or for general chat. AV VoizGame - as I always suggest: simple and easy-to-use and therefore it suits most new users in the voice changing era. To learn how to use the program to change voice, please read this topic. 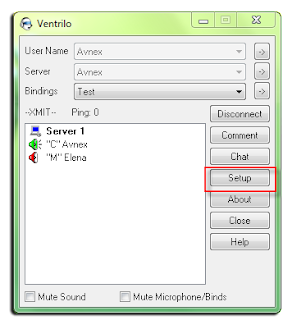 Below will be instruction on how to configure Ventrilo so that VoizGame will help you to change voice while chatting. Step 1. Open Ventrilo and access the Setup erea. Step 2. 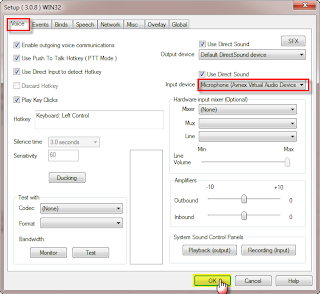 Select AVnex Virtual Audio Device as your microphone's driver device. IT'S DONE. Save and close the settings windows. All this configuration thing means that: from now on, Ventrilo program should always use the AVnex Virtual Audio device, which is an AV VoizGame's accessories, for processing and morphing the voice from your microphone. This should not affect your microphone's function in anyway. However, if you need to change your voice, you need to make sure that the VoizGame is open and the voice morphing is working.